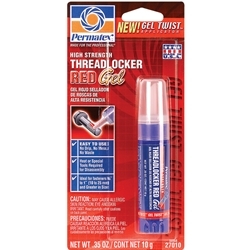 The patent-pending GEL TWIST™ pin-point applicator puts the Threadlocker where you want it...on the part! Gel formula provides “liquid-reliability” without drips, globs, mess or waste. High strength threadlocker for heavy-duty applications. Especially well-suited for permanently locking studs and press fits. Adds 3,000 PSI holding power on slip and press fit assemblies. Replaces set screws and snap rings. Locks against vibration loosening. May require heat or special tools for removal.